A few days after announcing the previous business agreement, we are happy to announce also our new partnerships for the Italian and Swiss markets. Trafficlab (part of the Progectolab group) is DataFromSky partner since half 2014 and is now the Official Distributor for Italy and Switzerland of the DataFromSky market. After a great promotion and sponsorship in Italy (Dronitaly 2014, Smart Mobility Forum 2014 and 2015) we are getting great satisfaction from our major trading partner. After a start slowed by regulatory difficulties for the overflight of drones in urban area, now the reliefs start increasing day by day. But the news does not end here. Recently two exclusive contracts with ESSE8 society and TAU have been signed. The Italian market so increases with two important business partners who will play the roles of regional exclusive sale representative. 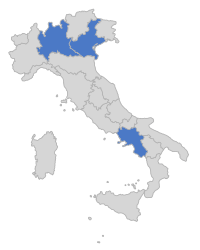 The ESSE8 engineering company has an exclusive contract until 2017 for the Veneto and Campania regions and also cooperates on the development of software applications for road safety. The company TAU specialized in monitoring and traffic simulations, has also signed an exclusive agreement until 2017 for the Lombardia Region, and is holding a balloon specifically developed for aircraft traffic surveys.